SINGAPORE, (Yonhap) -- US President Donald Trump and North Korean leader Kim Jong-un will meet for one day on Tuesday, the White House said, announcing the detailed schedule for the historic summit. The two leaders are to begin their high-stakes meeting at 9 a.m. as previously announced, with translators only, before moving on to an expanded bilateral meeting and then a working lunch, the White House said in a statement Monday. "The discussions between the United States and North Korea are ongoing and have moved more quickly than expected," it said. Trump had earlier left open the possibility of continuing talks over several days depending on how they went. 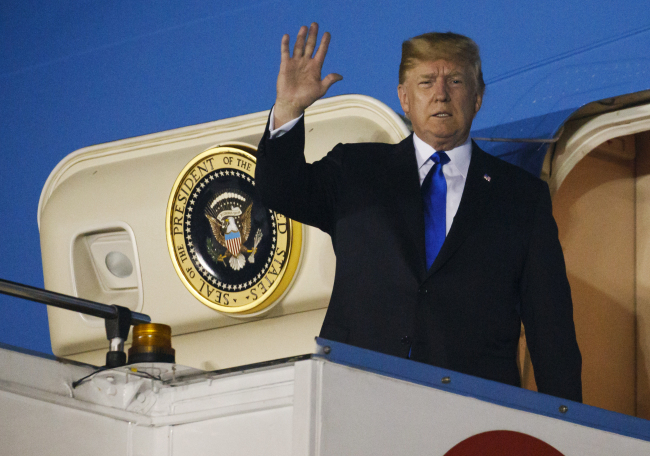 He is now scheduled to leave Singapore at around 8 p.m. Tuesday after holding a media availability, the White House added. Joining him at the expanded meeting will be US Secretary of State Mike Pompeo, Chief of Staff John Kelly and National Security Advisor John Bolton. The working lunch will be attended by White House press secretary Sarah Sanders; Amb. Sung Kim, who has led substantive talks with the North going into the summit; and Matt Pottinger, senior director for Asia on the White House National Security Council. The 9 a.m. meeting is scheduled to take place at the Capella Hotel on Sentosa Island off Singapore's mainland. It was not immediately clear whether the other meetings would also be held at the same site.